Right up the street from the Boylston Chess Club, the Somerville Theater is hosting a 90 minute documentary, Bobby Fischer Against the World, as part of the Independent Film Festival. Bobby Fischer: the name evokes at once the spectacular brilliance of arguably the greatest chess player of all time, and a notorious reclusiveness on par with the likes of J.D. Salinger. In 1972, the reputation of the entire free world rested on Fischer’s ability to defeat Russian Boris Spassky for the World Chess Championship in a tense game of intellectual strategy and psychological warfare that mimicked the Cold War itself. Thirty years later, the former hero’s anti-U.S. ravings prompted the government to threaten him with arrest if he ever set foot on this country’s soil again. Director Liz Garbus (SHOUTING FIRE: STORIES FROM THE EDGE OF FREE SPEECH, IFFBoston 2009) and late editor Karen Schmeer (THE FOG OF WAR) draw us into the strange world of Bobby Fischer, from his early chess monomania to a careful dissection of the legendary World Championship games, to his descent into a world of conspiracy theories, religious fanaticism, and anti-Semitism. Perhaps most fascinating are friends’ and experts’ speculations that chess itself—with its emphasis on suspicion and excessive forethought—may have induced or at least aggravated his debilitating psychosis and paranoia. Were Fischer’s genius and his eccentricity related? Or was the structure of the game the only thing keeping him from spiraling into madness? The next Grand Prix event is this Saturday. Only $7.00 to members, $10 to non-members. Take part in the race to the top. Recently, I noted that the Dallas Chess Club was one of our major national chess rivals, in terms of attendance of both strong and regular players. This weekend, I had a chance to check it out and play in one of their events. Located in Richardson, Texas, just north of Dallas, the Dallas Chess Club is located next to a pretty little park with a picturesque pond. Driving up towards the front door, I knew I wasn't in Davis Square when this little guy waddled in front of my bumper. In terms of space, I thought it was comparable to the Boylston Chess Club-- until I was led upstairs for my first round pairing. This extra annex room held about 30 people. Tightly. I had to fight my way through crowds to get to my board every round. They had a bigger room downstairs, but it wasn't clear to me why we were crammed into the upstairs rooms. The club has a nice skittles and TD area, with a vending machine for snacks. They have a modest collection of books that doesn't come close to the more than 2500 volumes that we have. They have some chess decorations and mementos, but the Boylston's chock-a-block full of chess trinkets and trophies earned over our 100 year history. Maybe the Dallas club is tidier than us and puts all that in storage. The club clearly hosts lots of tournaments, but their staple format is G30, a punishing and blistering pace for the over 30 set. The event I played, on a Saturday, started after 6 PM and used game 25 minutes + 5 second increment timing, a new format to me. After every move, you get 5 seconds added to your time, no matter how much time you used. That's right-- if you play faster than 5 seconds, you get extra time. This had a few tangible effects on the style of play at the beginning and end of the game. The openings are blitzed out (I couldn't write my moves down fast enough, so I didn't get so much time added to my clock). At the end of the game, winning positions slowly become even more clearly winning-- a player in time trouble but up a piece eventually makes up time with a series of quick moves and will rarely be in danger of flagging. Given the required heart health to play so quickly, it is also little surprise that the majority of players were under the age of 14. In fact, out of about 35 players, only 3 or 4 were adults, and most of them were pretty young kids. But don't kid yourself -- these kids are strong. At a current rating of 1970, I was 7th on the wall chart. The top player, 10 year old Tommy He, is rated over 2150 and he smacked me around using just a few minutes on his clock. 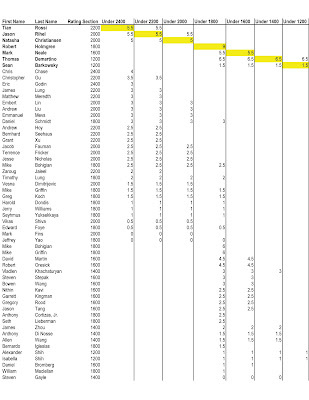 While I suspect that some of these ratings may be inflated by clock jockeying and local isolationism at Dallas's many rapid time control events, the speed with which Tommy calculated some complex lines told me his rating is legit (He is ranked 3rd for 10 year olds, and his quick rating is 8th for under age 16. Did I mention that he is a FIDE master?). I am proud to say that, despite my rapidly aging brain, his was my only loss to a strong field firing on all synapse-cylinders. All told, I have a favorable impression of the Dallas Chess Club. They were very friendly to an interloper and the kids were alright (rowdy, joking, but strong and serious about chess). If only the event had started earlier in the day, with a slightly more sedate time control, I might have kept my cortisol levels in the normal range. 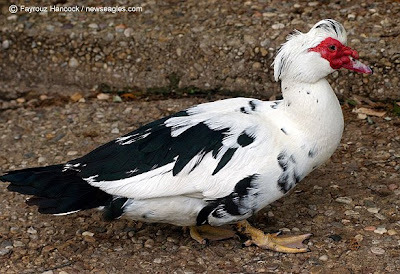 And maybe we should import some ugly ducks for Davis Square? 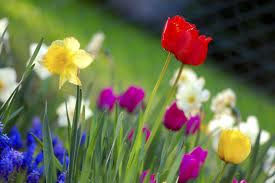 Spring Open -- the 2 day tournament is back! Reminder-- David Vigorito lecture on Wednesday! 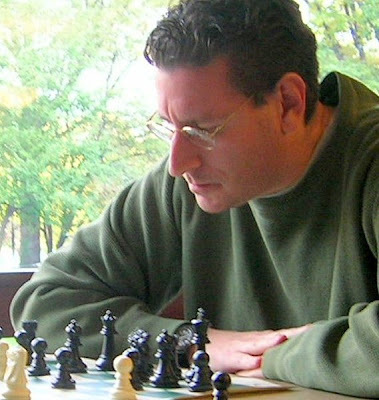 International Master David Vigorito has been the state champion of Massachusetts, New Hampshire, and Nevada and is one of the top 50 players in the US. He has authored several well-reviewed chess books and articles. A popular lecturer on chesslecture.com, he has given several entertaining and accessible lectures at the Boylston Chess Club. Drawing from his recent 6-0 result at the Amateur Team East, he will provide examples of practical middlegame and endgame play. He will also discuss study habits for amateur club players. ADMISSION: Lecture: FREE for Boylston members, $10.00 for non-members. 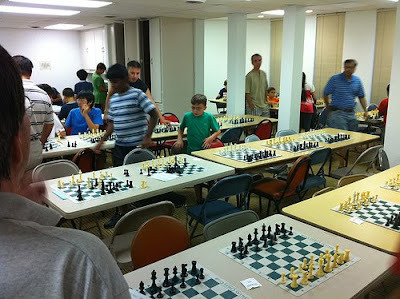 Simul: $5.00 for members, $10.00 for non-members. 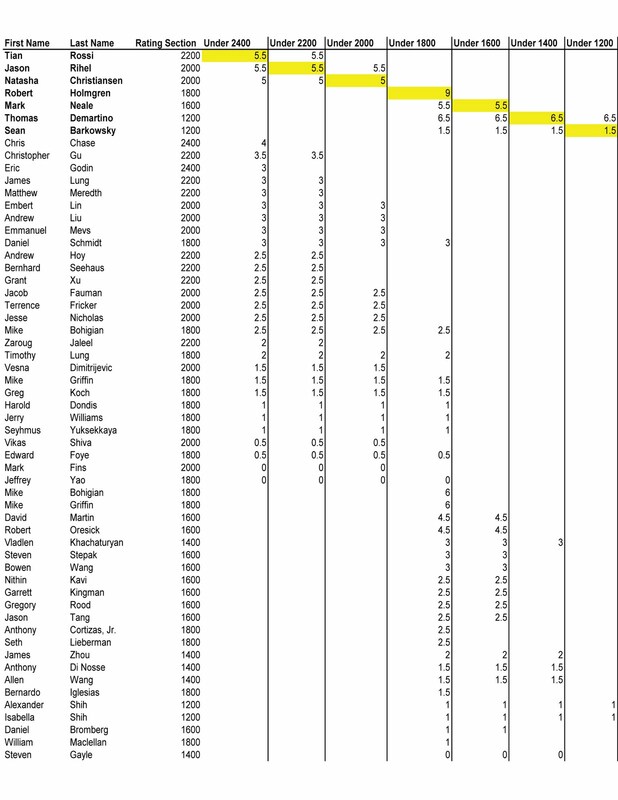 After some updates, the USCF list of active players at the Boylston Chess Club is now even stronger-- we have more than 100 players rated over 1900, and 200 players rated over 1550. The other "largest" New England club still has only 50 rated over 1900 and 190 rated over 300. This list also puts us ahead of the Mechanics Institute in San Francisco and the Chess Center in Saint Louis. Only Dallas and the Marshall appear to be bigger/stronger clubs (that I've found so far).